Introduction by Dr Louis Fenech, scholar on the life and works of Bhai Nand Lal Goya, University of Northern Iowa. Of the many dimensions of the Sikh religious tradition there is perhaps one which garners the least attention amongst contemporary Sikhs; although it is clearly an important aspect of the faith, indeed a foundational one. This is the Sikh tradition’s Islamicate inheritance. There are of course many reasons for this general neglect, the most significant of which has to do with the focus in eighteenth-century Khalsa Sikh literature upon the persecution suffered by contemporary Sikhs at the hands of those who were generally identified as Muslim. This disregard presupposes a conflation between things Islamic, that is elements pertaining to the religion that is Islam and the people recognized as Muslim, and things Islamicate, a cultural-linguistic reference to the vast region encompassing Turkey, Western and Central Asia, and India whose common language of administration was Persian. Both Islam and the Islamicate are obviously interrelated intimately but the two categories nevertheless differ markedly as well. In the many Sikh traditions regarding, and the Persian poetry attributed to, Bhai Nand Lal ‘Goya’ (circa 1633-1713 CE) the famous Sikh disciple of the tenth Sikh Master, Guru Gobind Singh (1666-1708 CE), these two elements come together and overlap with certain Indic themes, and this point of intersection forms one of the characteristics we shall excavate in this site exploring the works of this most august Persian poet in the extraordinary darbār or court of Guru Gobind Singh. By engaging these texts, reading them individually or collectively, or hearing them as kīrtan, contemporary Sikhs and others will be provided with a far more robust picture of the period leading up to and including the life of the tenth Sikh Master. The Zafarnama letter of Guru Gobind Singh from an early handwritten manuscript of Dasam Granth. 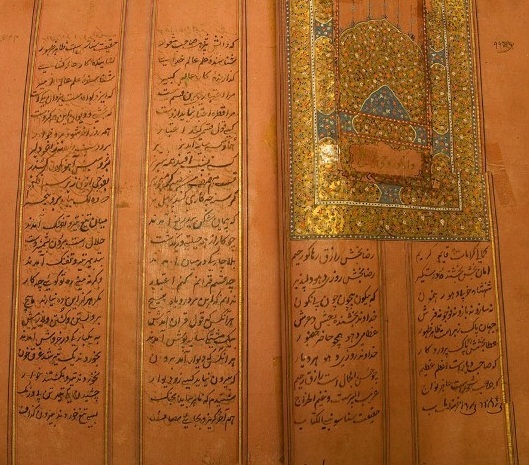 Although there are two distinct types of text, Punjabi and Persian, both of which differ noticeably it is the Persian works such as the Dīvān-i Goyā — that one can easily compare to some of the best Persian poetry to have been produced in Indo-Islamic India (13th-18th centuries) which will be referenced here. Nand Lal’s Dīvān is made up of 61 ghazals, 19 rubāúīyāt (quatrains), and 6 abyāt (couplets). The ghazal itself is a short ode style of poem which is composed of approximately five to fifteen individual baits and follows one of a series of strict rhyme schemes while maintaining a precise end rhyme. In some instances these ghazals of Bhai Nand Lal draw upon the works of the greatest of Iran’s poets, particularly those of Hafez Shirazi. Indeed, in just such an ‘answer’ or javāb to Hafez’s first ghazal, Nand Lal’s third ghazal makes his Sikh leaning abundantly clear. This topic I explored in the mid 90s in my paper “Persian Sikh Scripture: The Ghazals of Bhāī Nand Lal Goyā” which can be downloaded in the ‘E-Books’ section on this website. Although these Persian works are included under a single heading there are nevertheless differences between them, particularly the fact that while some make their Sikh content unmistakably evident the others do so in a much more subtle and creative way. These Persian texts would, along with the earlier-noted Dīvān-i-Goyā, include the Zindagī-nāmah (Book of Life) a maṡnavī made up of 510 distichs; the Arżulalfāẓ (Exposition of Terms) which is Nand Lal’s lengthiest work (at 1358 baits), also a masnavi, which combines a dizzying array of Persian, Arabic, and (less often) Indic terms in praise of the divine. At last there is the Tausīf o Sanāú (Description and Praise) which is predominantly in prose and likewise celebrates the divine through its lavish descriptions. There is finally the Persian Dastūrulinshā (Rule of Epistles) which, like the Tausīf o Sanāú, is in prose, but as the Dastūrulinshā is merely a guide to writing proper letters and other epistles within the court of Multan (at which Nand Lal was initially employed) that may also allude to some of the events during Nand Lal’s time in office, and rigidly follows the standards of all Indo-Islamic inshā literature, it does nothing to elucidate Sikh doctrine. It is, moreover, the only extant text attributed to Nand Lal which is not complete. By the Hukam some are born into high castes while others occupy the low; by His Command pain besets some and pleasure others. but also, in only one instance, references Guru Nanak by name in v. 127. Guru Nanak is the perfect spiritual guide whose excellence and wisdom encompass both this world and the next. Other Persian Nand Lal works which are more straightforwardly Sikh are the Joti Bigās or The [Divine] Light Effulgent, whose Punjabi title suggests that it is an attempt in Persian to expand upon the 43 couplets of the Punjabi Joti Bigās (manuscript 332164 at Punjabi University, Patiala titles this Persian work Tarjumah Joti Bigās or ‘[An] Interpretation of the Joti Bigās), the Ganj-nāmah (Treasury Book) which is divided into ten parts (and those ten each separated into two subsections) each of which deals with one of the Sikh Gurus in the order of their guruships. The ten [avatars of Vishnu] exist in order to watch guard over [the sangat]; the four [Vedas] are lovingly engaged (sargarm) in singing their virtues. All three of these are easily understood as Sikh works as these venerate the Sikh Gurus and their courts (Joti Bigās and the Ganj-nāmah) — a fact which likens these works to the Bhaṭṭān de Savvaīe or Praises of the Bards one finds in the Adi Granth — or speak lovingly of the Panth and the Khalsa (Khātimah) and are thus more in line with the later gur-bilas and rahit-nama literature. Based in part upon manuscript frequency one can say with some certainty that the two most popular of these Persian texts by far are the Dīvān-i-Goyā and the Zindagī-nāmah (often appearing together in a single manuscript) with the Ganj-nāmah coming in a distant second. It is likely that the reason for the former two’s regular eighteenth-century reappearance is that these are the only texts in which Nand Lal uses the famous sobriquet Goya or ‘The Speaker;’ the other Persian texts are signed exclusively with the takhalluṣ Lal, that is ‘gem’ or ‘ruby’. Lal is a slave dog of Guru Gobind Singh. The name of Guru Gobind Singh is branded [on his heart] / the nām [to which] Guru Gobind Singh [makes us privy] is branded [on his heart]. Dr. Louis Fenech has written extensively on the life and works of Bhai Nand Lal Goya. He has authored “Martyrdom in the Sikh tradition” and “The darbar of the Sikh Gurus: The court of God in the world of men” where he explores the courtly settings of the Gurus, particularly focusing on the majestic court of Guru Gobind Singh. In this book an entire chapter is dedicated to the life and works of Bhai Nand Lal Goya. In early 2013 his recent book ‘The Sikh Zafar-namah of Guru Gobind Singh: A Discursive Blade in the Heart of the Mughal Empire’ was published which seeks to analyze the Persian Zafarnamah letter of Guru Gobind Singh in light of contemporary Persian writings. Drawing out the Zafarnamah’s direct and subtle references to the Iranian national epic, the Shah-namah, and to Shaikh Sa’di’s thirteenth-century Bustan, Fenech demonstrates how this letter served as a form of Indo-Islamic verbal warfare, ensuring the tenth Guru’s moral and symbolic victory over the legendary and powerful Mughal Empire. Through analysis of the Zafar-namah, Fenech resurrects an essential and intriguing component of the Sikh tradition: its Islamicate aspect.